A very frequent question I get is how do I wash my cloth diapers. First, you should start with the most simple washing routine for your diapers (always avoiding the no-no items of bleach and fabric softners). If you start complicated, your wash routine will always be complicated. If you start simple, you may find that simple is more than enough for you. In which case, you’ve made your life infinitely easier. 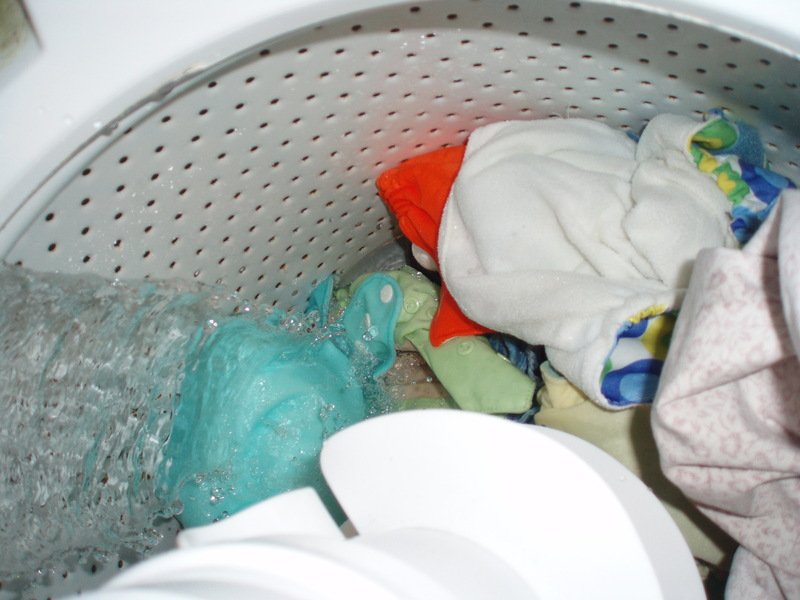 Second, the real trick to washing cloth diapers is using just enough detergent to get your diapers clean, and then using enough water to thoroughly rinse the detergent out. Seems simple, right? Well, the 1/4th a capful rule makes many people wary of using too much detergent and they end up with ammonia build up. Don’t be scared. If you use too much detergent, you can always rinse it out. You won’t ruin your diapers by using a little more detergent. Lastly, take into account your load size. A very small load of diapers (10 or so) will need very little detergent. 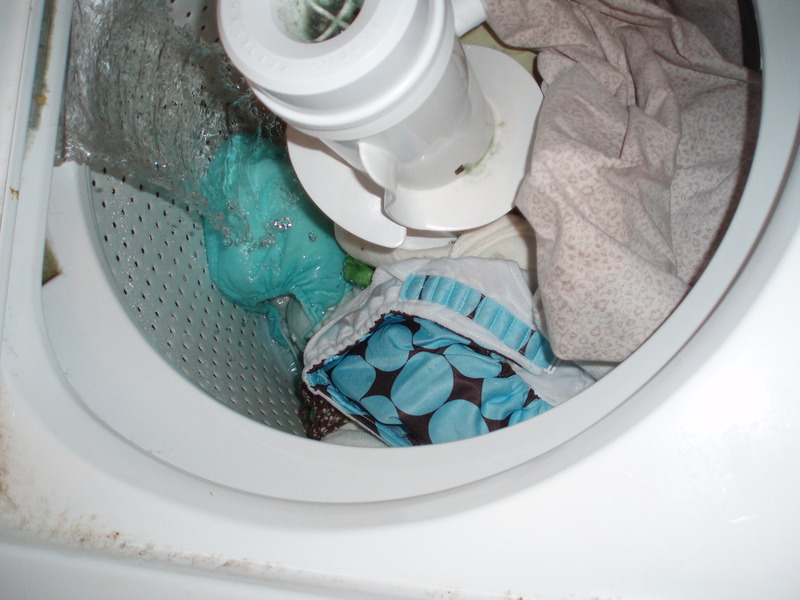 If you are cloth diapering 3 and your load is 30 diapers, you’ll clearly need more detergent. Also, if you have a load size setting on your machine, always over estimate your load size, rather than underestimate it. You need water to clean your diapers! One of my first questions when I was beginning to cloth diaper was, “What on earth is a diaper pail?” I couldn’t think if people were using Diaper Genies or what. 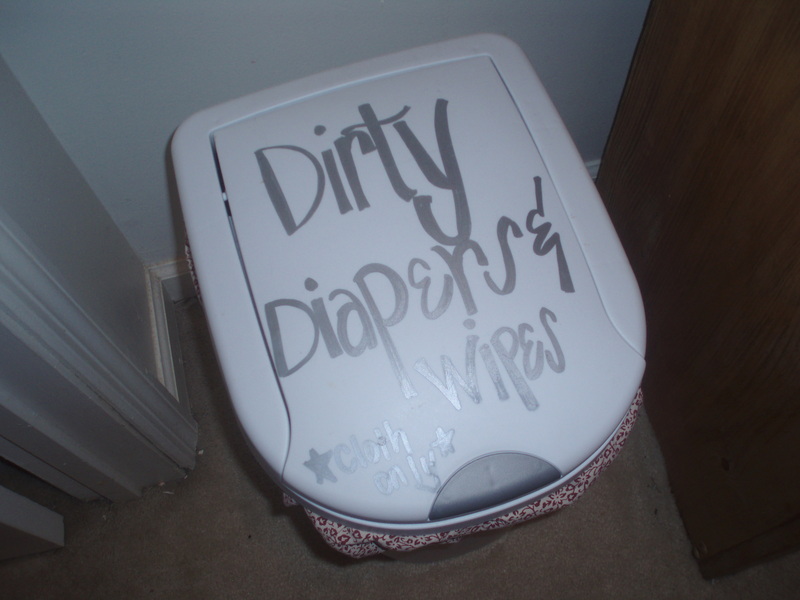 You can use a Diaper Champ or something similar, but the easiest is using a kitchen trash can with a lid. You can see mine have liners. I made them from some extra home decor fabric I had lying around. I made two, so while one is in the wash, the other is in the pail. But it isn’t even waterproof?! I realize that. You can make a waterproof liner, but I don’t see the need. When I remove my liner and throw it in with my diapers, I spray my pail with Lysol. I let it sit and dry, then put a new liner in. In over a year of doing this, I have no problems with it. If velcro, secure velcro to laundry tabs. 2. Add 1/2 capful of detergent (I know, you’ve heard to use a forth of what you’d normally use. I did that, it did not get my diapers clean enough. So, now I use half a capful to 3/4 a capful!) and turn washer on for a hot wash with warm rinse. That concludes my wash routine! You can use the special diaper detergents, but to start off that way goes against my “keep it simple” rule. So, I decided simple would be buying only one kind of laundry detergent for my entire household. I have used original Tide, regular All, All Small & Mighty, Arm & Hammer with Oxi Clean, and some super cheap kind at my Mom’s house. My favorite is Arm & Hammer with Oxi Clean. It is cheap and works well. (And it smells really nice!) Trying to decide on a detergent? Avoid “free & clear” varieties. Avoid anything with added fabric softner, water softner, or bleach. I also think the liquid kind rinses easier from cloth diapers. I every other week to every week wash once using plain blue Dawn instead of my detergent. It seems to keep build up problems at bay to routinely Dawn your diapers, though it is far from necessary. Need a deep clean but don’t want to use Dawn? Use more of your detergent (and you can add a scoop or two of Oxi Clean) and add a couple more rinse cycles to the end of your wash. It is amazing what a really good rinse will do. What about using baking soda or vinegar? Once again, to start with, keep it simple. Baking soda added to the initial rinse can help with detergent build up. Vinegar added to you end rinse cycles can sometimes help with ammonia build up. Sometimes vinegar will make your problem worse. Baking soda can make ammonia problems worse. So, jump these hurdles if they come, don’t start out using either. How do I know if I have ammonia build up or detergent build up? We often automatically assume it is the dreaded detergent when we have issues. Detergent build up will show up by your diapers not absorbing as much as they should. You’ll begin having unexplained leaks that are not caused by improper size or infrequent changes. Your baby could get a rash on their bum, but it usually doesn’t make your diapers smell. If your baby has a rash and your diapers have a smell (sometimes out of the dryer, sometimes when peed on) but are not leaking, ammonia is probably the culprit. What do I do for detergent build up? What do I do for ammonia build up? A Dawn strip may help you quickly get your situation under control. Increase the amount of detergent you are using, because you are clearly not using enough detergent to get your diapers clean (thus the build up). You may need to increase you rinsing to make sure you rinse the increased amount of detergent out. If you can, once a week add an extra rinse cycle or two to your normal load. I call this a “mini-strip” and usually do mine with Oxi-Clean or Dawn instead of my usual detergent. What do I do if I’m still not sure if my problem is detergent or ammonia? Easy. Do the most simple thing. Increase your detergent and add an extra rinse or two. To keep it from recurring, you can increase both your detergent and rinsing permanently. A strip or “mini-strip” would help both! How many rinse cycles must I do? Typically, one extra rinse is enough. ( rinse + wash + rinse + rinse) If you find that isn’t enough, you can increase your rinsing in one of two ways. You can add on rinses to the end *rinse + wash + rinse + rinse + rinse) or you can increase your load size on your washer, so each rinse uses more water, thus rinsing a little better. (small load to medium load) In my experience, water is the key to clean diapers! Isn’t machine drying rough on your diapers? Yes. I never dry my PUL on anything but low heat. I am not very easy on my diapers (should give you a little more confidence in my reviews). You can line dry your diapers, I just find very little time for such things. How often do you wash diapers? I wash mine daily. Some people wash every other day. Some only wash twice (or once!) a week. I have too many diapers to wash anything other than daily. My diaper pail is completely full by the end of the day! Also, Aidan pees acid. If his diapers sit longer than 36 hours, they must be washed twice to get all the ammonia out. Doesn’t washing diapers take a lot of time? Still have questions? Feel free to ask!